No 8 (like sister engines 7 and 9) had probably the oddest application of the rail blue livery during the 1970s. The Vale of Rheidol Railway (VoR, Welsh: Rheilffordd Dyffryn Rheidol ) is a narrow-gauge 1 ft 113⁄4 in (603 mm) gauge heritage railway that runs for 11¾ miles between Aberystwyth and Devil's Bridge in Wales, UK. It was the last steam line to be operated as part of the nationalised British Railways network. The originally-planned primary purpose of the line was to serve the mines in the Rheidol valley, carrying ore, especially lead, and timber (for pit props etc) to the sea and the main line railway at Aberystwyth. But by the time that the railway was built, lead mining in Ceredigion was in steep decline. Construction was begun in 1901 following an Act of Parliament in 1897. Rock was hand-hewn instead of being blasted in order to save money. The railway was unusual in that it developed its tourist potential by carrying passengers from its opening: the line opened for mineral traffic in August 1902 and for passengers on 22 December 1902. On 1 July 1913, the line was absorbed by Cambrian Railways. 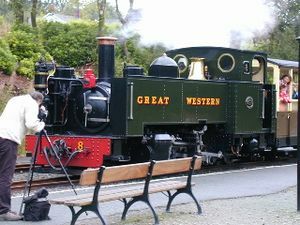 It was subsequently grouped into the Great Western Railway (GWR) network in 1923 and incorporated into the nationalised network in 1948. 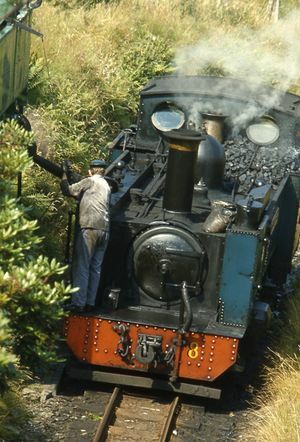 The line was finally privatised in 1989 and still operates as a tourist railway offering an hour-long journey through spectacular mountain scenery, much of it at a gradient of 1 in 50. 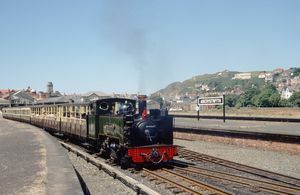 The headquarters of the railway are at Aberystwyth, where it shares a terminus with the standard gauge main line, trains leaving from a bay platform. There are seven intermediate stations, all request stops. When the lead mines were being worked there was an aerial cableway linking them with Rhiwfron. This page was last edited on 2 January 2008, at 23:01.